Following several requests, I spent the last two weekends baking all sorts of keto-friendly bread loaves. Many of my readers have been wondering whether my Original Keto Bun recipe - which became viral over the social media - can be used to make a loaf. I didn't know for sure so I decided to give it a try. Also, many people requested that I include a nut-free & flax-free version so I made them too... Yes, it was a lot of bread loaves and my freezer is now packed! As you may know, flaxmeal has a distinctive taste that may work great for savoury uses but it's not ideal if you want a more neutral taste. So if you are planning to use the bread in a sweet recipe (maybe bread & butter pudding? ), it's better to avoid flaxmeal. More troubleshooting tips are included at the end of this recipe. Similar low-carb, keto and paleo-friendly recipes can be found in my Apps and also in my upcoming cookbook! Nutrition facts are calculated per 12 slices. Macronutrient ratio: Calories from carbs (8% / 11%), protein (28% / 45%), fat (64% / 44%). you can use the Ultimate Keto Bun recipe - it's without sesame flour, includes flaxmeal and almond flour. If making a loaf, bake for 75 minutes. It's my personal favourite because it tastes amazing and I've had the best results with this dough. 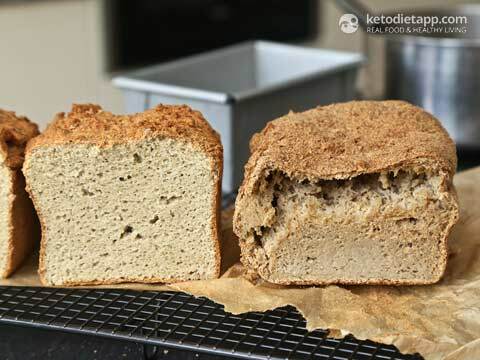 or Nut-free Bread based on Nut-free Keto Bun recipe - includes flaxmeal. If making a loaf, bake for 75 minutes! or Psyllium-free Bread based on Di's Psyllim-free Keto Bun recipe - includes flaxmeal and nuts. If making a loaf, bake for 75 minutes! if you need to make it coconut-free, use more sesame seed flour instead of coconut flour. In my experience, sesame seed flour has similar high-absorbent properties as coconut flour. If you use almond flour or flax meal instead, you will need to reduce the amount of liquids used in this recipe. I haven't tried it but I'd use 2-3 less eggs/ egg whites and 1/4 - 1/2 cups less water. Preheat the oven to 175 °C/ 350 °F. Line a loaf pan with parchment paper: Simply cut two strips of paper - one should be the width of the sides and one the width of the ends. Make both strips long enough so that they hang over the edges and then place them in a loaf pan. The strips of parchment will be used to lift the bread from the pan. You can make the paper stick to the pan by lightly greasing the pan with ghee. I used a 20 x 12 cm / 8 x 5 inch loaf pan. 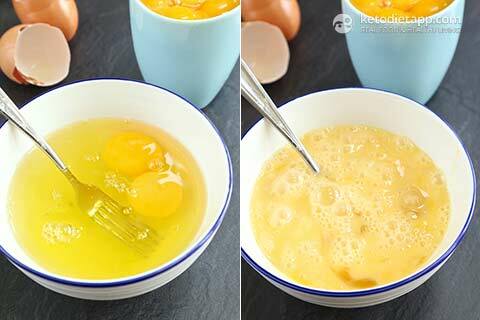 Place the whole eggs and the egg whites into a bowl and mix using a fork. Set aside for later. The reason you shouldn't use only whole eggs is that the buns wouldn't rise with so many egg yolks in. Don't waste the egg yolks - use them for making Home-made Mayo, Easy Hollandaise Sauce, Frozen Fat Bomb, Smoothies, Keto Coffee or Lemon Curd. Place all the dry ingredients in a bowl and mix well. Make sure the dry ingredients are well combined to avoid uneven results. 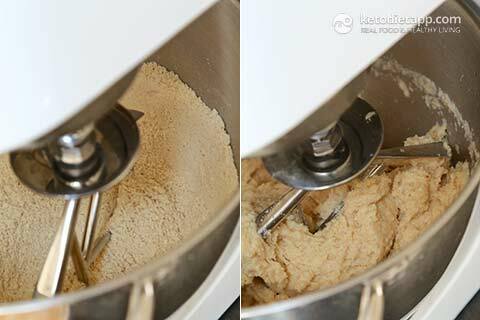 Add the egg mixture and process well using a mixer until the dough is thick. Add boiling water and process until well combined. Do not use whole psyllium husks - if you cannot find psyllium husk powder, use a blender or coffee grinder and process until fine. If you get already prepared psyllium husk powder, remember to weigh it before adding to the recipe. I used whole psyllium husks which I grinded myself. Do not use just measure cups - different products have different weights per cup! 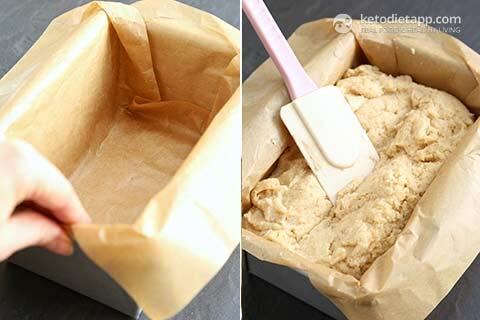 Place the dough into a loaf pan lined with parchment paper. Place in the oven and bake for 1 hour and 15 minutes (or up to 90 minutes). When done, remove from the oven and place on a cooling rack. 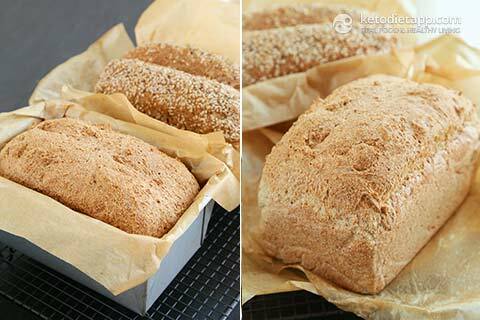 Grab the sides of the parchment paper and place the bread on the cooling rack to avoid the bread from becoming moist on the sides. Once the bread cools down, cut into 12 slices. Keep as many slices as you need for the next 2-3 days. Place the remaining slices in batches of two in freezer bags and freeze for up to 3 months. When ready to be served, simply let the slices defrost or place in a toaster, oven or on a hot pan to crisp up. Top with butter, cream cheese, sliced ham and cheese or home-made ham. 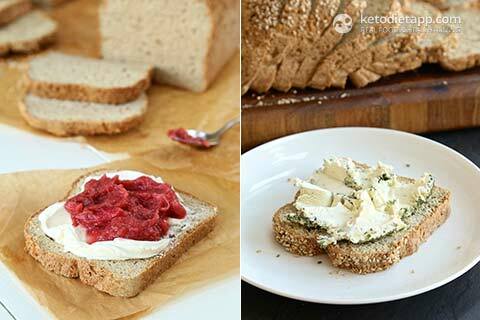 Try Strawberry & Rhubarb Jam or Dark Cherry Chia Jam! Enjoy! Weight all dry ingredients: Make sure you weigh all the dry ingredients using a kitchen scale. Even small differences can affect the final result of this recipe, especially in case of psyllium and flax meal! Psyllium notes: Make sure you use psyllium husk powder, NOT whole psyllium husks. Whole psyllium husks are great for making Grain-free Tortillas but not bread! Also, psyllium absorbs lots of water. When baking with psyllium, you must remember to drink enough water throughout the day to prevent constipation! Moisture issues: If the final result is too moist inside, do not reduce the water used in this recipe or the psyllium will clump. Instead, toast the slices before eating. Do not leave the dough out for too long: Once you mix in the wet ingredients, make sure to place the dough in the oven as soon as you can. The mixture is activated with baking powder once you add liquid ingredients and if you leave the dough out for too long, it will not rise. Other raising issues: If the bread doesn't rise properly, use only egg whites and omit the egg yolks (I never needed to do this). Sesame seed meal instead of sesame flour. If you use ground sesame seeds instead of sesame seed flour, you will have to reduce the water needed by ~ 1/4 - 1/2 cup in the 2nd recipe. 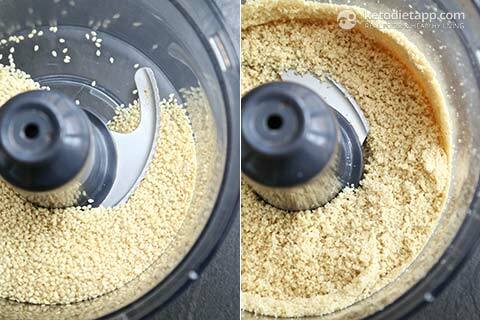 I use a food processor to make sesame seed meal or you can use a coffee grinder. DO NOT USE a silicon loaf pan! As I discovered by accident, the bread will not rise properly and the dough will be dense and unappetising! You need to use a firm pan like this one. 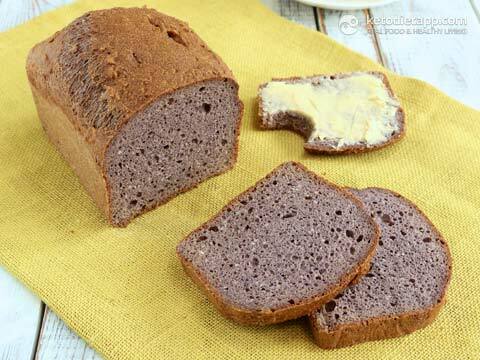 Purple bread. If the bread turns out purple, it's due to the psyllium husk powder. 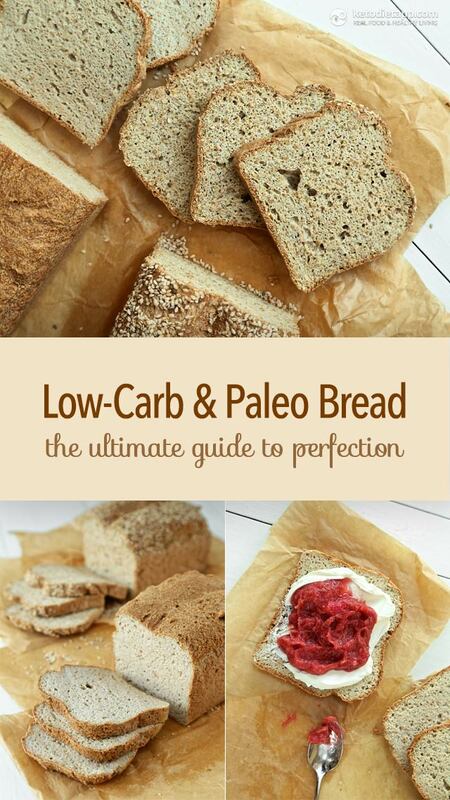 Whenever I use Now Foods psyllium powder, the bread is always perfect, light brown. I sometimes use whole psyllium husks which I "powder" myself in a food processor. The loaf on the right side has been over processed. Baking paper stuck to the bread. This will happen if you use the nut-free version that includes sesame seed flour. You can remove the paper after you let the bread cool down. If it's still difficult to peel without breaking the bread, use a piece of wet kitchen towel to pat on the parer where it's stuck. Then peel off. Just made this for the first time and it came out perfect. One of the best receipts out there. Not because it worked great, but because there was not pop up every 3 seconds, AND I absolutely loved all the tips if it does not come out right. That shows me a lot of effort went into making this post. Kids liked it too which is why I wanted to try bread. I was confided in the other day the only reason my kids do not like the keto lifestyle is because they miss the bread and do not like the 90 second microwave bread. So good job ! Is it possible to use the carton of egg whites in this recipe? I haven't tried that myself but someone mentioned it works well in the comments below. Martina, wow! Thank you for this recipe! It’s delicious! Smelled amazing while baking, and turned out perfectly. I split the top and added sesame seeds, and added 10 drops of Sweetleaf, and it tastes as good as it looks. I couldn’t wait for it to cool before having a slice.  This recipe is a keeper for sure! Thanks also for your comments about the brand of psyllium husks you use—I tried Now Foods, and no longer have purple bread! Thanks again. Have made recipe #1 twice. Weighing ingredients exactly, using baking powder, NOT over mixing - lightly just until combined, Putting in pre-heated oven as soon as is combined and both times is heavy/wet. second time I used only egg whites (per recommendation if heavy) and was still wet! almost inedible - needed to cut in middle and rebake - in oven for over 2 hours..... I can try buns, but what might be wrong? Should I try a higher Oven temp? I am grinding my own psyllium in coffee grinder..... can't identify where I am going wrong. Thanks!! 1) Whole psyllium husks/flakes. These work well for tortillas (Best Keto & Paleo Tortillas, Taco Shells & Nachos) but not so much for bread as they may clump up and the bread is not as fluffy. 2) Store-bought psyllium. I haven't tried all the available brands but the ones I tried resulted in very dense, purple bread. The powder was often too dense. 3) I always achieve the best results with whole psyllium husks that I powder in a coffee grinder or a food processor (the S blade) - it will take longer to process but it helps if you can fill it up to at least half of the capacity. Can you use parchment paper rather than the baking paper? And, do you know if using a glass bread pan would affect the outcome of the baked product? Anxious to try this recipe. I am new to Keto and have a 3 road trip coming up and will not be able to cook. I was thinking of making this bread and bringing with me. How long does it last unrefrigerated? I'd say 3 days just to be safe. The moisture might be an issue (risk of mold) if left for longer. The recipe actually came out just fine! Today I doubled up on the recipe and needed to separate and remix and add a bit more water. My loaves rose crazy high, and then colapsed a bit on the bottom of the loaf. Next time, I'm definitely doing one recipe at a time. I accidentally did 2x amount of physlium husk powder. Will my bread be okay? Hi thanks for this recipe, I ve just made it, very tasty. Was really fancying something breadlike. I had a bit of a shock when it came out purple, having taken recipe from app. Are you supposed to leave to rise before putting in the oven? As it didn’t rise a lot. Tastes great though. Hi Jo, I think this is caused by the psyllium - are you using psyllium powder or whole husks which you "powder" yourself? I found that most store-bought psyllium powder makes my bread purple and really dense. The products I found were all too dense. Whenever I make my own psyllium powder by grinding whole husks, the bread is nice and fluffy. Hello!! !I have a doubt, coconut flour does not have many carbohydrates for a low carb diet? Could I replace it with almond flour? I am wondering about the “Eggy” taste. My Wife and Ibtried a recipe and it was a Perfect 10 on appearance but tasted like a cold omelette..it was GROSS! Does this bread have that Egg taste to it? I was wondering if either recipe would work as well in a bread maker? Hi Daniel, just like the comment below, I'd love to know that too! I'm sorry but I've never used a bread maker machine. Maybe others could comment? I have made this bread twice now and it is perfect!! Thank you so much for this recipe!!! 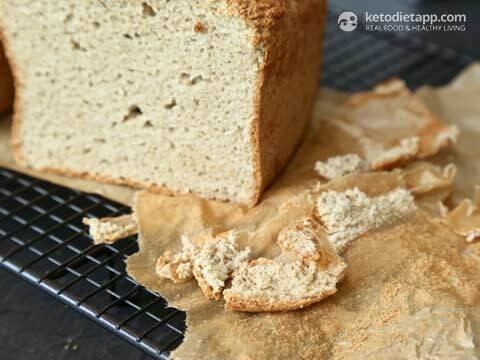 I am new to the Keto lifestyle and look forward to trying this bread recipe. I would like to know, can this bread be baked in a bread maker machine? Hi Ashlie, I'd love to know that too! I'm sorry but I've never used a bread maker machine. Maybe others could comment? Quick question, what do you do with the 8 egg yolkes? I've seen several recipes that all for psyllium husk powder. Psyllium husk is used as a laxative! For that reason, I can't bring myself to try and eat recipes using this laxative. Has anyone had stomach problems after eating this bread? It can affect digestion but only if you eat too much of it. A slice of bread will unlikely cause any side effects. Any high-fibre foods can have laxative effects. I'm curious if psyllum husk a necessity or can I use something else that works just as well. Hi! I've been meaning to try your nut free (but not flax free) bread recipe. All links to the nut free bread seem to lead to a blank page. Can you point me in the right direction for where I can locate this recipe?! Can't wait to try! I'll check once more in case there is a broken link somewhere I didn't see - thanks! Thank you for the many, many versions of this bread that cater to everyone's preferences and allergies! Trust me, I greatly appreciate it. I have one issue though, I am allergic to almond and sesame but I am good with all the other ingredients (flax, psyllium, coconut, eggs..). Is there a version of the bread(s) that omits sesame and almond? I came to this page to read the troubleshooting tips, as my "ultimate keto buns" did NOT turn out right. In reading, I see you say "Make sure you use baking powder, not baking soda! ", however the recipe for the buns says powder, and there's even a picture of a "bubble bicarbonate of soda powder" container. You can either use baking soda + cream of tartar as it's used in the Ultimate Keto Buns. OR you can use gluten-free baking powder as it's used in this recipe. Either will work. You shouldn't use baking soda instead of baking powder, but only use it combined with cream of tartar. I tried the first recipe. I substituted the sesame for the same amount of ground flax seed and cut down the Eggs to 2 with yolk and 4 egg white, And cut the water to 11/2 cups The bread came out good. However, it was moist. I used Now Psyllium Husk Powder twice now and both times turned purple. Tried this recipe twice and on both occasions I got hollow tops / air bubble. On the second try I reduced my processing of the dough in the hope of a better outcome .....no change. After the second time I realised that the baking powder I was using was a year out of date ....oooops! I'll try again with newer Baking powder....hopefully that's the fix. I did reduce the garlic powder to 1 tsp as I felt it was a little strong for my liking and I didn't have onion powder so that was omitted anyway. Crust is delicious on this ...I can't wait to try it again and hopefully the air bubble problem will be sorted. I hope the next batch comes out great! Please, make sure you read the "troubleshooting" part in this post in case it helps. I made recipe 2 today and it ended up being SO dense. Like, Irish soda bread dense. Smells great, though - haven't had a chance to try it yet. Any thoughts on where I went wrong? I left it in for 80 minutes in a lined metal pan, used sesame seed meal and reduced the water to just over 1 1/2 cups. I wasn't sure what consistency I was looking for in the dough, so perhaps that wasn't quite enough water? (The dough itself was quite heavy, thick enough that it needed to be spread out with a spatula and wouldn't settle into the pan on its own.) I also used carton egg whites for what was called for (1 1/2 cups in place of the 8 egg whites) which was mentioned as working by a commenter, but could very likely be the issue. It did also turn a lovely hue of lavender, (Viva Labs Organic Psyllium Husk Powder) which is fantastic, honestly, and doesn't bother me at all.  Thanks! Hi J.M., I think it may have needed more water but I can't be sure. If you don't use enough, the dough may not rise properly. The dough shouldn't be too dense because it wouldn't have space to rise. I don't use carton egg whites so that may be the reason too. My only experience with carton egg whites wasn't brilliant - I used them for making muffins and they didn't rise well. I hope the next batch comes out great! I'm confused by these new variations as compared to the original keto buns recipe. Do I use 1 tablespoon of baking powder or do I combine 1 teaspoon of baking soda with 2 teaspoons of cream of tartar? When I made the original keto bun recipe as a load today (used baking soda plus cream of tartar), it expanded hugely in the oven but the top two-thirds of the loaf was a hollow bubble. The bottom third was dense and soggy. Or is the problem not related to the rising agent issue??? Thanks. Hi Marina, you can use either 1 tablespoon of gluten-free baking powder or a mixture of ¾ tsp baking soda + 1 ½ tsp cream of tartar for every tablespoon of gluten-free baking powder. Please, see more tips in the Troubleshooting section above (hollow tops/ air bubble). I hope this helps! Hi, thank you for this blog! I have a question, can I use a glass loaf pan? Hi Martina! I follow your page on facebook and I belong to the Keto Diet support group, which has been very helpful in my weight loss. What is your opinion on using non flavored protein powder for bread? Do you recommend it? And if so, do you have a recipe? Thank you very much!!!! It should't be that runny - have you weighed the dry ingredients? Did you use large eggs? Martina, I have a question about making these sweet, such as for cinnamon rolls. If I increase the amount of sweetener, so I need to add more Eggwhites or water to make up for the additional dry ingredient amount? I would also be interested in knowing how you made your cinnamon rolls. Did you roll this out flat, top with the cinnamon roll filling, roll it back into a log, then cut it into individual rolls, or did you simply mix the cinnamon, etc., into the entire dough? Hi, I could not find sesame seed flour in my country so I will need to make my own sesame seed meal. I want to do the first recipe so how much water would I need to use? 1 1/2 instead of 2 cups? Hi Erin, I would use 1 1/2 to 1 3/4 but that's just a guess. I hope you like it, let me know how it went! Martina, I never heard back from you. Do you know not reply when people write in? Can I use chickpea flour instead of almond flour? I haven't tried (not in the keto & paleo list) that but maybe others could help? Is it ok to get the prepackaged egg whites for this? I am not sure I could reasonably find a use for all the yolks every time I make this bread. Thank you for all your work and great recipes on this site! Hi T, I tried them but the bread was deflated. I would use fresh egg whites. To use the egg yolks, you can try hollandaise, custard, lemon curd, etc (tips in the post). Phsyilium husk really causes me to have a lot of pain. What can I use as a substitute? Thanks for the tips, I'll have to try that too! Wow. Very nice. I been wanting to get a really good bread recipe. I will try this soon. Can I use a bread maker? I have one that I haven't used and thought it might be easier. Just wondering if there is anything different if I chose this route. Thanks! is there a way i could sub the coconut flour? Yes, you can use ore almond flour instead but you'd have to reduce the amount of water. Or you can try flax meal or sesame seed flour instead - in such case I'd keep the amount of water the same. I haven't tried it coconut-free but I'm sure it will work. Anyway, i just tried making your bread and it is fantastic! I served it to a friend for dinner last night (toasted to go alongside coconut curry chicken) and she couldn't believe it was so healthy and gluten free! Hi Martina. I love your work (my wife & I are anxiously awaiting your cookbook, and currently use your KetoDiet app on our iPad). I've been recommending your app and blog for my patients. I've had good success with your bread recipes, though after doing some research I tried substituting Glucomannan powder (Konjac powder) for Psyllium powder (measure for measure) in your Ultimate Keto Bun recipe for making a loaf of bread (in fact I scaled it up to a 9"x5" pan, an Emile Henri clay bread loaf pain [which has a cover]) - and HOLY MOSES did it turn out well! Thank you Rimas, I really appreciate that! That's an amazing suggestion. Did you use same amount (as per cups or grams) and did you have to adjust the other ingredients as well? Thank you! 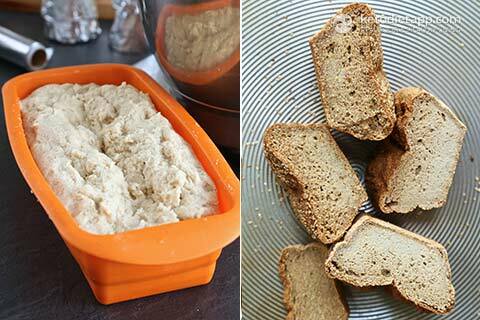 Would you mind sharing Rimas recipe for the psyllium free bread? I believe he swapped it for the konjac powder instead. Thank you. I used the same number of grams of glucomannan as grams of psyllium in your recipe, all else was kept the same. It seems to consistently bake up very well. I've also adapted the Ultimate Keto Bun recipe to make Lithuanian Bacon Buns (i.e. buns filled with bacon lardonnes sauteed with grated onion in the middle) - your recipe is very versatile. I'm glad to have bought your Keto Diet App, found your blog, and we are thoroughly enjoying your cookbook. Keep up the great work! Thank you so much!! I'll have to give it a try... especially that bacon & onion recipe! Ok great, thanks! I think I might try both ways, but actually now I'm leaning towards just making the other recipe for buns in bread form! Could you share your recipe with the konjac powder? I would like the measurements and see what changes made to them? Thanks in advance! Hi Sara, I just approved the comment - Rimas said an equal amount in weight. Hope this helps! I can't wait to try this! In your opinion, which recipe option tastes better...1 or 2? Wow that's mean! There are hundreds of recipes in their app and you complain about one that she shared? Seriously the whole app with like 300 recipes is for 10 bucks and they add new recipes for free all the time. This bread is amazing! I made the second recipe and added some onion powder and caraway seeds and used one egg yolk for brushing the top. It's definitely the best nut-free bread I've tried so far. It was maybe just a bit too moist inside, especially the day after but toasting it really made a difference. Thank you Molly! The buns are my favourite one too! Do you know on which Phase of Atkins diet this would be eaten? I am on Induction Phase and will be on it until I loose 50 lbs. (One month and down approx. 10 lbs and blood sugars improving). I'd like to thank you in advance. Hi Gene, I'd avoid any bread recipes or treats for the first 3-4 weeks. It's just better to avoid anything that replaces common high-carb foods to avoid cravings. First off, thank you!! Mine tastes quite good, but is very dense. Nothing like the photos. What do you think I did wrong? Hi Michelle, which recipe did you use? Did you use the same ingredients? 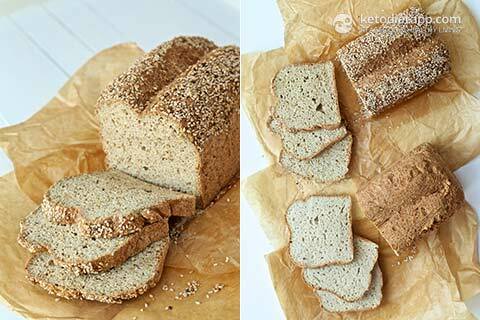 Did you use sesame seed meal or sesame seed flour? How about the loaf pan (did you use metallic one?) and temperature? 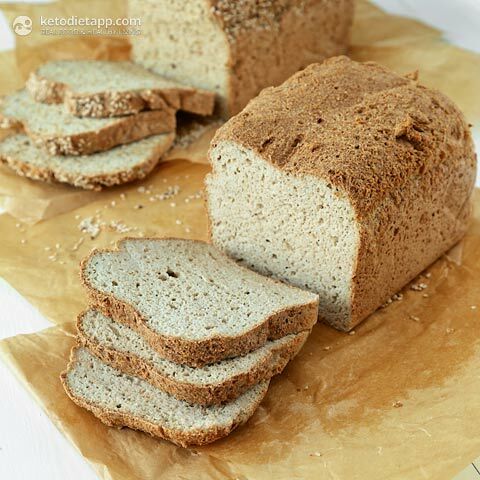 I'm going to make this bread with sesame seed meal today and post more tips once it's done - more details about the exact amount of water needed. I did recipe #2 when I meant to do #1. Anyway, did exact recipe - no substitutions. I used Konsyl brand as the fiber. The loaf is really dense and even a slice weighs a ton. I'll recipe #1 today and see if I do better. I just made it today and will post some updates in the notes. I think that for the second recipe it may help to use 2 more egg whites. I made it today and it was perfect. I guess you meant Konsyl psyllium powder? I haven't tried that one but if it's psyllium powder it should do the job. I've made this bread twice and it was always perfect!! First time I used the original keto bun dough with garlic and onion powder and then I made the flax-free version. This is a keeper, me and my family loved both!! Thank you Kathryn, I'm glad to hear that! How could I make sesame seed flour? Just grinding sesame seeds up? Hi Sevi, sesame flour (link in ingredients to Amazon) is not exactly the same as sesame seeds that have been ground = sesame meal. Sesame seed flour has less fat (some fat has been removed), is very fine and absorbs more water. You can use either but if you decide to use sesame seed meal, you will need to reduce the amount of water needed, especially in the second recipe where I'd use 2 1/2 cups instead of 3 cups. Do you think that this dough would work for cinnamon rolls? I can't eat flax (cancer medications) and nuts (allergy)... Thanks! What can I use to replace the sesame seed flour? I'm allergic. The only psyllium husk powder I have found that turns bread purple is Yerba Prima brand. Frontier brand is extra-active, and will result in larger loaves (or buns). Maria Emmerich says if your loaves are coming out hollow or deflating while cooling, reduce the amount of baking soda--since the above recipe has no baking soda in it, this shouldn't be a problem. I can't remember which brand made my bread purple but thanks for the tips! The baking powder I use is a mixture of cream of tartar and baking soda but since there is only one teaspoon of baking soda in this recipe (1 tablespoon of gluten-free baking powder = 1 teaspoon baking soda + 2 teaspoons cream of tartar), I never had this issue. Another reason for hollow insides could be using whole husks instead of fine psyllium powder - or using a silicon loaf pan - the bread was always deflated and dense when I used it instead of metallic loaf pan. I've had bread deflate in a glass pan AND a metallic pan--that's when I resorted to just making buns and tortillas. The time I made small "sub sandwich" rolls also turned out well, but I used no bread pan--just laid them out on a papered baking sheet. That's interesting.... I've made 6 loaves over the last 2 weeks, 2 of them in a silicon pan and the ones in the silicon pan were deflated and very dense on the bottom. The ones baked in the metallic one (lined with parchment) had the support to rise and were perfect. I agree, it's just easier to make the buns - they are always perfect  I haven't tried the "sub sandwich" but I did get a baguette tray that is curved and perforated so I'll have to give it a try soon! I also had the same problem with the bread raising beautifully only to deflate later, and when I cut it, it seems like it's not cooked in the middle. I had the same issue with the smaller buns, so I'm thinking it's to do with my oven settings. Martina: Do you use a fan forced oven? It could be the temperature - my guess would be that it's too low? Yes, I used a fan forced oven. This happened to me every time I used a silicon loaf pan. I think that the bread needs firm support from all sides and the silicon loaf pan would never provide it. The only thing that was different in my case was the pan - the exact same dough raised when I used a metallic one. I hope the next batch comes out great! Your bread recipes are the only ones that works for me. Like Karla-all the others (even Maria's) rise beautifully in the oven, then deflate and are goop inside and really dense-I have tried every kind of psyllium, all kinds of measurements,all kinds of pans, and they do not work...I am really looking forward to trying this-I am sure it will be wonderful! Thank you Lisa, hope it works great!! I'm just going to post some further notes in the post, as I made the bread again today. What about a yellow birthday cake recipe? I have made tons of different recipes and they are all dense heavy and nothing like a cake. I've got a birthday cake in my to-do list because I have my own birthday very soon  I'll post it on my blog in the next few weeks. I can't wait to try all the versions of this bread. It looks like the real deal! Thank you, hope you like it! Thank you! I love the keto buns and I'm making the bread tomorrow, can't wait! You are simply my hero!! I was one of those who wanted a flax-free recipe and now I can't wait to give this one a try. I may go for the nut-free version because I'm also trying to cut down on nuts  Thank you so much and keep up the great work! !